In walmart under $4, you can get the new Wet n Wild Coloricon Contouring Palette. Today you will be able to see swatches and read a review. These compacts are quite big and they are claimed to be smooth in texture and will not look flaky on the skin. Looking at the size and look of the product, they do remind me of Make Up For Ever Sculpting Kits which retail for $48. I have a Make Up For Ever Bronzing powder and can state that they are smooth and amazing! Each Wet n Wild Coloricon Contouring Palette, contains 0.46 oz or 13 grams of product. Based on a few reviews which I have seen online, reviewers claim that the highlighting shade is buttery while the contouring shades is smooth. It has been compared in texture to Marc Jacob’s contour kit. 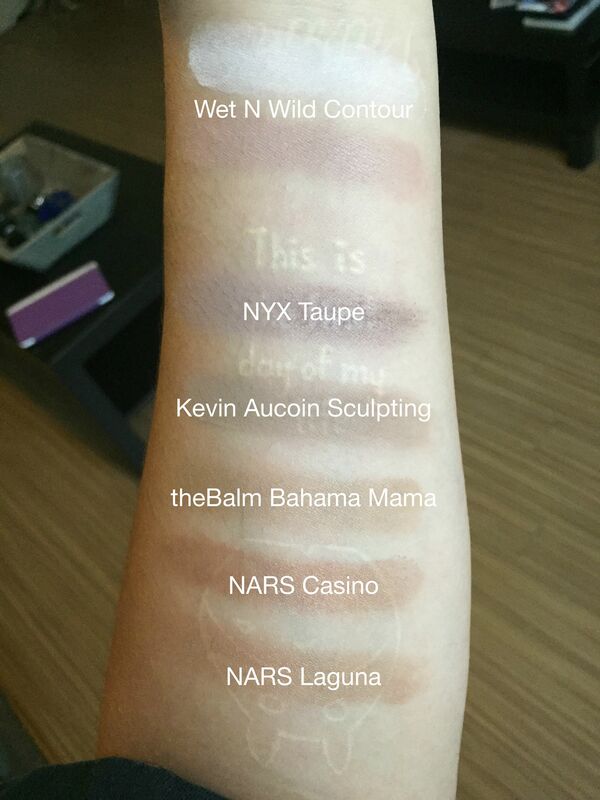 The contour shades have a cooler undertone as you can see in the swatches below. The only con is that the highlight shade is very sheer and is a bit chalky when built up. This con might not apply to all skin tones. Left: Marc Jocobs 40 Mirage Filter Right: Wet n Wild Caramel Toffee The contour shade in both of these dous are soooo similar! Love these both for highlighting and contouring! ?? ?